Children in Africa have shown a prevalence of up to 54 percent of HIV strains which display a resistance to one or more commonly used antiretroviral (ARV) drugs according to a study published in Clinical Infectious Diseases. Is this an indication that currently used medications may prove to be ineffective in years to come? Africa has seen a significant scale-up in the coverage of ARV medications in the last decade. However, the increased availability of treatments has coincided with the rapid increase in the prevalence of drug resistant HIV. Six of the eleven countries across Africa, Asia and Latin America that were surveyed, over 11 percent of strains were found to be resistant to commonly used ARVs claims The World Health Organization (WHO). The WHO sets a threshold value for drug resistance of 10 percent, following which a recommendation is put forward to the country to urgently review its HIV treatment programme. The importance of addressing drug resistant HIV has been acknowledged by the new WHO Director General Dr Tedros Adhanom Ghebreyesus. “We need to proactively address the rising levels of resistance to HIV drugs if we are to achieve the global target of ending AIDS by 2030” he said. The goal of achieving a world free of HIV and AIDS by 2030 is facing fresh challenges. Current events in Venezuela have left the country in a state of political and financial instability. Supply chains of many medications, including ARVs for the treatment of HIV have run dry, leaving many patients untreated. Basic supplies such as condoms are now no longer being distributed, leaving a once world leading HIV treatment programme in ruins. The specific situation in Venezuela was covered in a previous article by Hyderus. The situation in Venezuela alone could offset the goal of ending HIV. Studies are finding that drug resistant HIV strains are becoming increasingly common in Venezuela, which, if left untreated, could lead to the country becoming a reservoir of drug resistant HIV. An example of these studies found that around 50 percent of analysed HIV samples from Venezuelan patients harboured mutations that made the virus resistant to treatment (susceptible to only one class of drugs or to none of the studied drugs). Venezuela is not an isolated case. Drug resistance to HIV, as well as many other conditions is on the rise on a global scale. Though the ARVs are available, supply chains are often inconsistent, and individuals may not be able to take the medication as often as it is prescribed. This is thought to be one of the driving factors of drug resistance. A study conducted in South Africa analysed the difference in drug resistance prevalence between rural and urban populations. The results indicated that drug resistant HIV was more common among rural populations. This was due to lower levels of adherence to a treatment programme. In many rural locations the supply chains for medications are inconsistent, a person may be able to acquire antiretroviral medication one month, but be unable to source any the following month. This causes lapses in the treatment that may render any sporadic use of medications useless, opening the way for the infection to spread to others. As drug resistant HIV is more common in rural, and often poor populations, the limiting of treatment options that it causes could have more of an impact. The only treatments that may work could be more expensive. South Africa provides free HIV treatment to all those infected with the disease. If the only effective medications are more expensive second and third line therapies the public health system will be forced to pay more per person. Failing this purchasing of the more expensive medications could fall to out of pocket payments from the affected individuals, potentially driving many into poverty. During the South African study it was found that 54 percent of children from a group in which treatment failed possess a drug resistant strain of HIV. The most common set of drugs the virus was resistant to were nonnucleoside reverse transcriptase inhibitors (NNRTI). This set of drugs include Sustiva (efavirenz, Bristol-Myers Squibb) and nevirapine, which are commonly used in first-line combination ARV (cARV) therapy in countries which are highly endemic. NNRTIs operate by specific obstruction of the binding site which allows reverse transcriptase of HIV to occur. 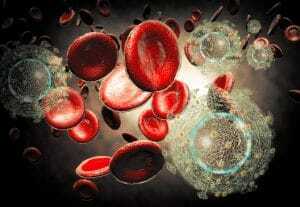 This is part of the mechanism by which HIV replicates itself within a host cell. HIV consists of a single strand of RNA, this RNA strand uses reverse transcriptase to form a double strand (DNA) which can then integrate into the host’s chromosome. At this point the host cell is infected and will begin producing more copies of the HIV virus. NNRTI’s prevent these viruses produced within one cell from infecting other cells. They do this by stopping the virus from integrating itself into the cell’s own genetic material. This therapy limits the number of infected cells within an individual by preventing further infection. However, any human cells produced by replication of the originally infected cells will still possess HIV DNA within their chromosome. NNRTIs are therefore not a cure, but are effective in limiting the viral load in a person’s bloodstream. Worth noting is that while NNRTIs can limit the number of HIV particles in a person’s blood, the person is still capable of passing on the virus. If passed on to a new host human who is not under the protection of an NNRTI, the virus can still replicate. NNRTIs are used primarily as part of a combination therapy. Untreated, or partially treated HIV (due to lack of adherence to treatment) is allowed to replicate at a rapid rate due to a higher viral load. This is the factor that increases the chances of drug resistance being developed. Every time the virus is replicated within the host’s cells, there is a chance of mutation. This mutation is not directed in any way, and is as likely to grant resistance to a drug as it is to make the virus unviable, or even to have no effect at all. The mutation rate and the risk of resistance is entirely down to mathematical probability. If HIV is treated, its replication rate is very low, and therefore the chance of mutation arising from a replication is also very low. If the virus is rapidly replicating, creating thousands of copies, this creates a higher number of times a mutation may occur resulting in drug resistance. To place the chances into perspective, the mutation of a single amino acid is responsible for the immunity to the commonly used NNRTIs mentioned previously. The K103N mutation involves the 103rd amino acid of the HIV genome altering from a lysine molecule to asparagine. This alters the binding site that these medications specifically attach, reducing the effectiveness of the medications. As this resistance can potentially occur from a single mutation, it is far more likely to occur than a resistance in which multiple genes must be disrupted. The reduction in effectiveness of first line medicines is an alarming development. 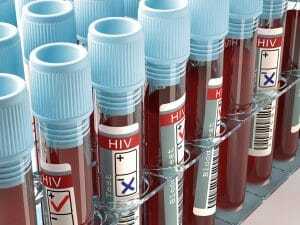 The WHO has released mathematical models which predict that if no action is taken, and current treatment methods are maintained despite resistance, HIV infections could increase significantly. In the next five years, with no action taken, an additional 135 000 deaths and 105,000 new infections could occur. Alongside this, the model predicts overall HIV treatment costs could increase as much as USD $650 million. Currently, there are a number of goals in place to address the situation of HIV drug resistance. Firstly, effective surveillance of all HIV patients is encouraged by the WHO. This is to ensure medication is routinely taken, as most front line treatment options are still effective. This is an important step, as it could allow for the situation to be controlled before it becomes more severe. Research into more treatments is also a priority. The creation of more treatment options available could address the resistances with alternate therapies as they occur. There are however initiatives underway to address the issue. Under a deal with the Gates Foundation a combination therapy antiretroviral will be provided across Africa for a maximum price of $75 USD per year per patient. This combination therapy will include dolutegravir, an integrase inhibitor that is effective against current drug resistant strains of HIV. Though the plans have been established to address the rise of drug resistance, the implementation is far more complex. This is illustrated in the case of Venezuela, where drug resistance is rising at an alarming rate and yet financial aid to help in the provision of treatment has so far been unavailable. Situations such as this, if not addressed urgently, could make the goal of HIV elimination by 2030 impossible.